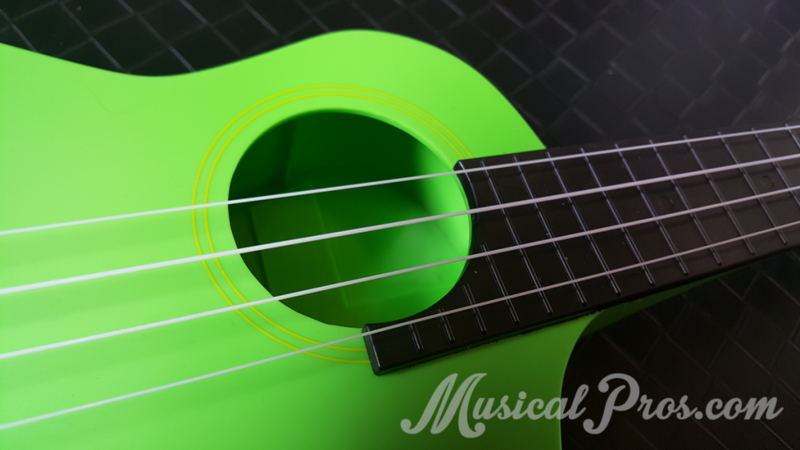 The BugsGear Travel Ukulele (or Aqulele) is one of the best plastic ukuleles you can find today. The BugsGear Travel Ukulele makes for a great ukulele to take anywhere there’s a chance of getting wet. It’s also a very sturdy and durable ukulele for kids. 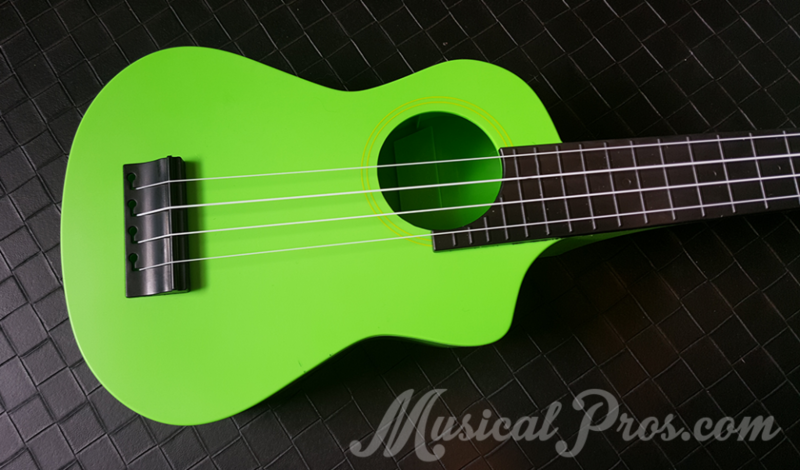 The BugsGear Travel Ukulele comes in a wide variety of fun and interesting colors. I went for the “Glow Stick” (sadly it does not glow in the dark), which is a bright neon green and black. 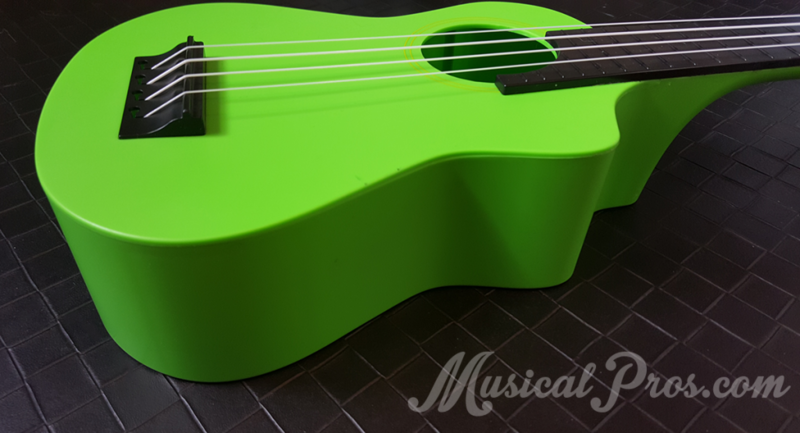 From afar, you couldn’t guess this ukulele is made of plastic just by looking at it other than the bright color. 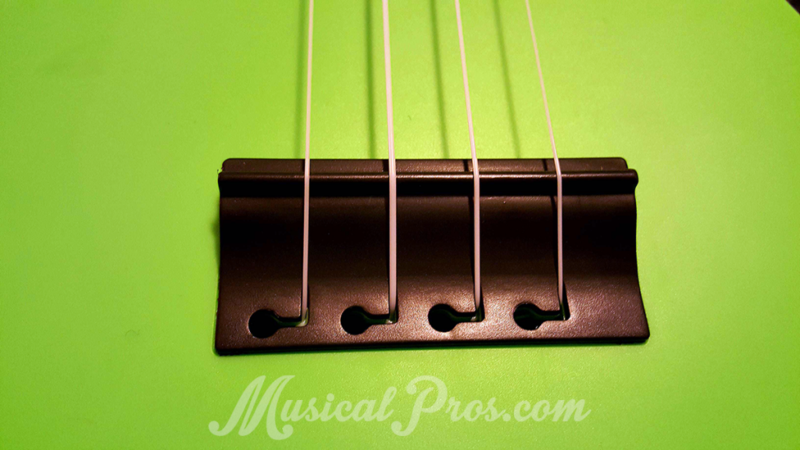 The Aqulele is Soprano in size and measures just about 21 inches long. The body of the ukulele is quite thick and took some time for me to get used to. It’s about 2.75 inches deep all the way around the body. The bridge of this ukulele is very beginner friendly. Although it comes already strung, if you want to change the strings you only need to tie a knot in one end and slip it into the slot on the bridge. The tuning gear is stainless steel for water resistance. Being made out of ABS plastic, the BugsGear Aqulele is incredibly resilient to changes in humidity and temperature. It even plays just fine after being submerged in water! 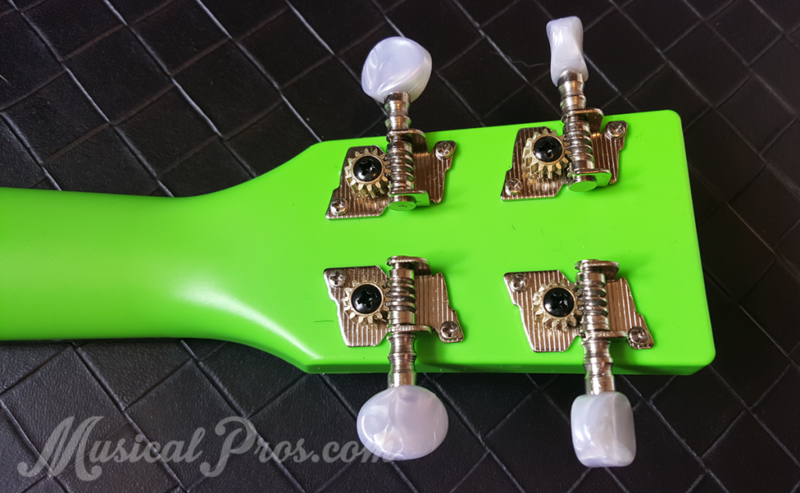 Inside the body of this ukulele you can see another selling point – it has a lot more internal bracing than most ukuleles. This body will withstand a lot of abuse and won’t easily damage from being smacked around. Always a great thing if you’ll be sharing it with little ones or taking it on adventures. 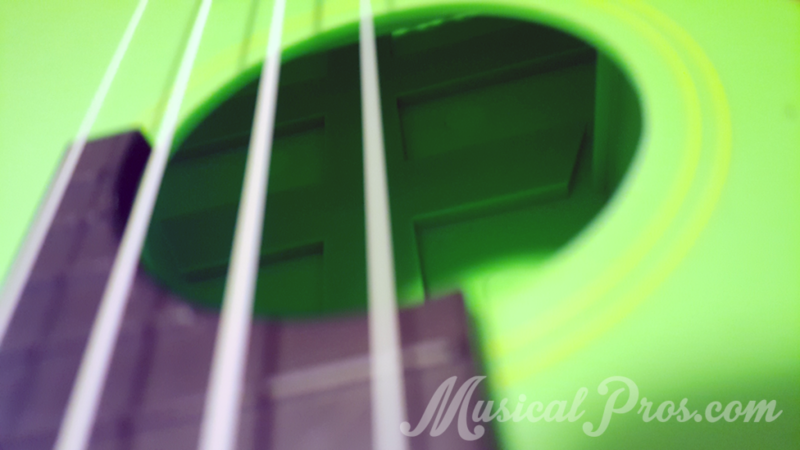 One of the things that makes the BugsGear Ukulele so unique and interesting is the oversized and off-center sound hole. They say this is to give the small uke greater volume and projection, and we agree that it’s quite loud. The fretboard has an interesting cut to it, giving you access to the A string all the way to 18 frets which is unique for a soprano ukulele. Overall, the sound won’t be mistaken for a ukulele made of real wood, but it still sounds shockingly good. When most people hear “plastic ukulele”, they probably think of a toy, but this is a legitimate musical instrument. It doesn’t quite have the soul of a wooden ukulele, but that’s the trade off for extreme durability and water resistance. This ukulele blows everything else out of the water at this price point! The fact that you can get this for $40-50 is amazing! I think a high quality plastic ukulele such as the BugsGear has a spot in every ukulele player’s arsenal. Heading to the beach or a pool party? Why risk ruining your expensive ukuleles when you can bring one that sounds great and can withstand all the abuse that will be thrown at it? Another great bonus for this plastic travel ukulele is the free gig bag that comes with it. It features a carrying handle, strap, and zipper pocket. The BugsGear Travel Ukulele scores a perfect 10 out of 10 from us for the value it delivers for the price. This is an awesome ukulele that I’d love to recommend to many musicians. If you’re buying a ukulele for a child, this is a great choice as it can withstand them bashing it around or any spills that come its way. Also, if you’re looking for a 2nd ukulele to add to your roster I think this travel ukulele is a perfect fit as it gives you the versatility to take it places you would be afraid to take your wood ukulele. If you’re looking for your very first ukulele, I would suggest you go with something wood just so you get a feel for the more classic ukulele sound. Unless you’re on a budget, in which case the BugsGear is your best bet to get a good ukulele for under $50. Check here for prices.